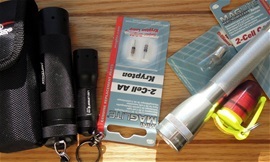 In many ways the small LED flashlights can be more useful and one of the big advantages with them is the small package. I have used the small types much and also during the day. A small flashlight can be useful sometimes on a postage stamp or a postcard. It can be useful when I do a full check on a pocket knife. It can be useful if doing maintenance on a device. The advantages with a LED are the durability of them and that it can give much light with little energy. The reason for why the powerful flashlights with LEDs get so warm is because it transfer heat from the LED and out to the surroundings. So it is not necessary any problem. They are just not so very useful for the small things. Some of the super abilities of a LED can be in question and there is a limit for how much heat it can transfer without getting to hot. Many times there is a safety measure in them to prevent overheating. Too much heat will damage the lifetime of the LED and the ideal lifetime will wrong. To prevent overheating and correct heat transfer some flashlights are made big with different cooling steps. 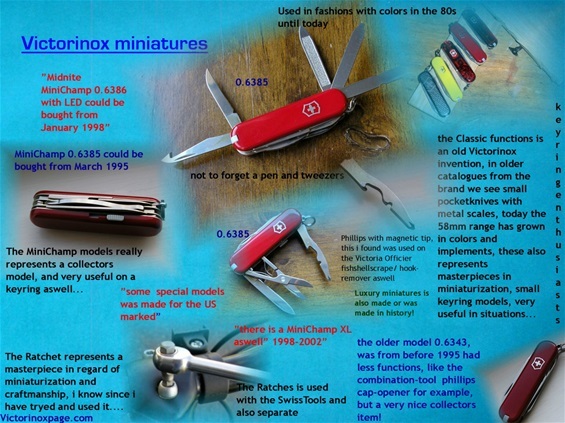 from my old page Victorinoxpage.com I always try to improve my English and writing. The key is to have fun with it. Rock on! 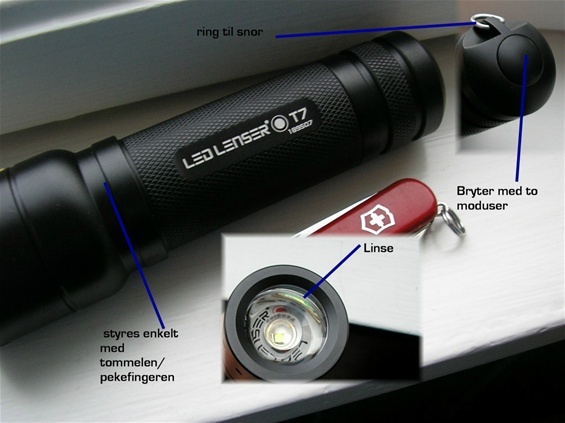 Today it is no problem finding a small LED flashlight that got better light and longer battery life than the old style MagLite. This is a key factor because it takes less space and it can fit on the key ring set. 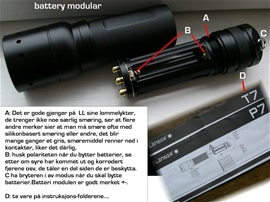 MagLite make LED flashlights today with a shape that is very similar to the older ones. It is a fair product for different uses. I like them and they got one of the best handle designs out there. On the picture is the older type…. Many lasers are harmless and they can be useful in the everyday life for people. As a general rule no laser should be pointed at the eye. Some lasers can travel a great distance and cause trouble for people. Never point any laser towards a car, boat, helicopter or airplane. Everything depends on the strength and class on the laser but the general rule is to never point it at a person. Some lasers can be very dangerous. I base my info on peoples inputs. 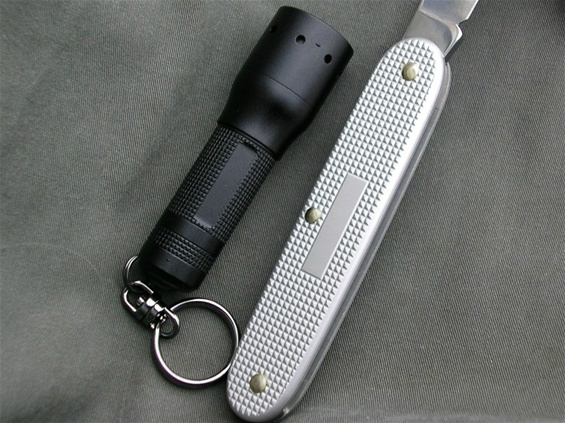 There is absolutely no reason to ban or limit the amount of light power from any flashlight. It is a helpful and needed tool. It is one of the innovative and technological inventions that people can enjoy. The use of LEDs with different power is used everywhere today. It is used on headlights on cars or instruments. In general the LED is completely harmless and the only problem is how strong the light is. The LED will not hurt you but the amount of concentrated beam with power can be disturbing or harmful. The small flashlights with a diode with lumens 20-80 is not any problem but it can be disturbing or reflecting. From 80-140 is no problem and I cannot imagine that this will be dangerous for the eye itself but it can be very disturbing and reflecting. If you sit and stare in the light then any light source can be disturbing or may be some harmful. The limit is the 140-200 and I cannot imagine that this can be dangerous for the eye but it can be disturbing for a period of time. You will be dazzled. When 200-300 extra light discipline must be taken but it is not dangerous and you will be very dazzled. With a beam or alternating light beam with frequency it will be dazzling. This area of lumens is a very useful strength and needed. With 300-500 then it will not only be dazzling, it may immobilize for a period of time and be hurtful. 1000-3000 = very useful tool but can be a hazard if not used correct. 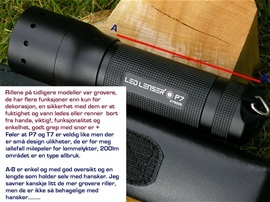 On the picture you can see a Varta flashlight that is very solid made. This one got two power modes. It is not a powerful light but it a useful and ok type. There is one thing that bothers me about it and I will explain why. In the market today there are enormous amounts of LED types and reflector technology. When using this light towards a surface then you see that the light is not distributed evenly. The rim of the different light and shade is disturbing when using it because it makes it more difficult for the eye to focus. It is important that the light is distributed evenly. The use of a flashlight on a weapon is normal today. When the light is on a subject then the human eye make an impression and react. Things on a person may reflect and give the wrong first impression. I would also recommend that you try a flashlight with an even distribution of light. Everything is within reason but an uneven light and the different shades of it can disrupt the focus of your eye. 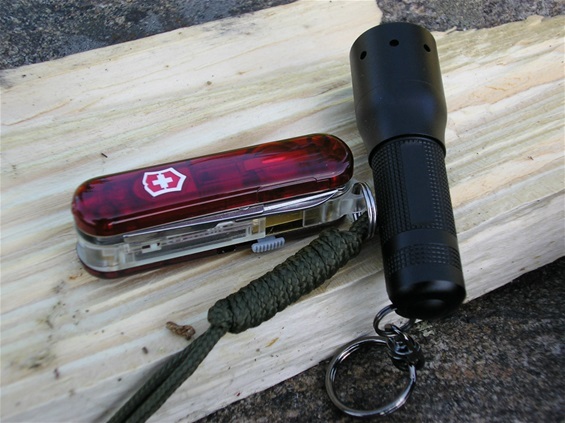 A flashlight can be a rescue tool or contain advanced programed communications. It can produce a tactical light and power. Remember when using filters that the flashlight may get warmer and that the heat signature of it may be strong. To make a signal or communicate with a flame or a device is an ancient form of communication. The use of communication with a light depends on many factors today. 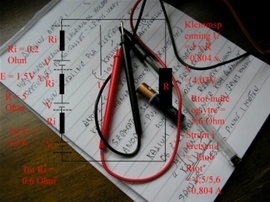 To program a LED lamp today is possible and this will or can become very advanced if needed. It can also be used as a storing device or identification device. The use of a laser option for communications can be done by an advanced producer. It may sound like 007 or a science fiction device to some but it is true. Laser technology is very advanced today. Communication with light should never be under estimated or people should never forget the possibility of electronic technology in combination with light. At maritime school i did learn the different meanings of signaling and lanterns. A beacon can contain information not only in light but also other means of communication. The possibilities with light are enormous! Håper Dere tilgir eventuelle skrivefeil for det er en stund siden disse ble laget. 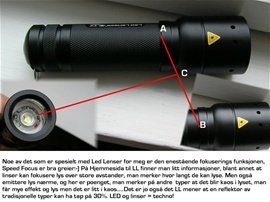 Flere av produktene jeg viser om Led Lenser er eldre LED produkter også. Jeg kjenner også til problemer med brytere osv. Mine er helt i orden. A quality flashlight got quality machined threading. 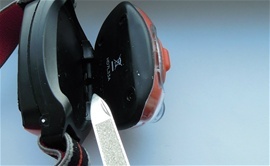 They must be precise and together with a rubber sealing be able to prevent water or dirt from entering the body. It is important with the threading that they are easy to turn and easy to attach with the cap and so on. Some products today have "lube free" type threading. It is ok.